You don't have to waste your time trying different security tools for your smartphone protection, ESET Mobile Security provides the necessary security for everything you need. 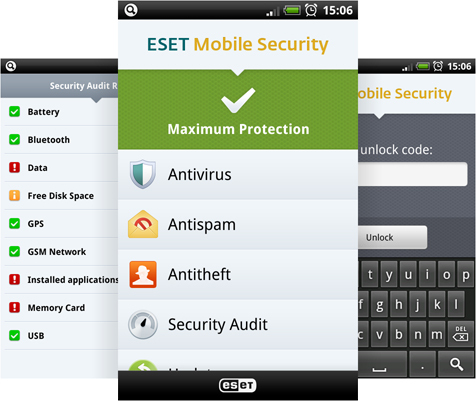 ESET Mobile Security protects your smartphone through: an advanced scanning engine, firewall, anti-spam and anti-theft protection, all this without slowing down your smartphone. Protection against malware - through an efficient scanning of all your smartphone content (files, folders, SD memory cards). Blocks unwanted messages - so you can decide from whom to receive messages (SMS / MMS) using a predefined blacklist, or you can choose to don't receive messages from strangers. Stops undesired calls - stopping both received calls and outgoing calls (this is useful for parents who want a limitation of their children's actions). You are aware of your smartphone's status - so, information like: free disk space, battery life, running processes, bluetooth and device visibility, are always available. - Remote Wipe - you can delete all data from your smartphone from distance through a simple SMS. Is a trial software (is limited to 30 days of use), but you can, also buy a license.